wild. here. : Local Ottawa Urban Nature Blogs for your reading pleasure! 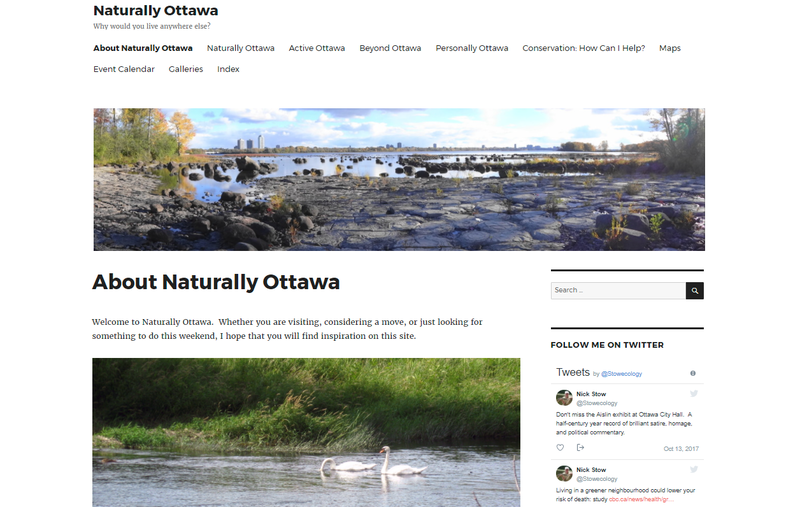 Local Ottawa Urban Nature Blogs for your reading pleasure! Ottawa has an amazing amount of greenspace and many enthusiastic nature-lovers. There are many clubs, activities, experts and photographers and the nature community is keen and plentiful. There's a lot of resources online also, some that I've highlighted in past posts (Wild. Here. 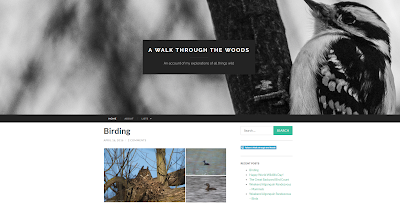 Exploring: birding, geocaching and Ottawa's Poets Pathway (website) + Wild. Here. Other Online Urban Nature Resources: iNaturalist, Naturehood) but many more for those curious and interested to find them. 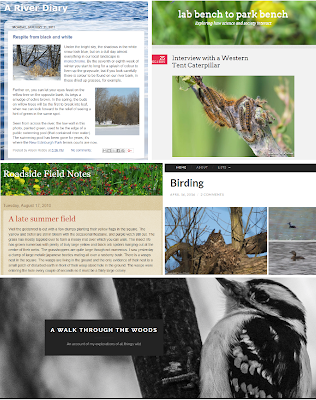 So here's a list of local Ottawa nature blogs that I have found during my years of blogging. While some of them are not being updated anymore there still is wealth of knowledge to find within them and here's hoping that there are more bloggers sharing their knowledge in the future! 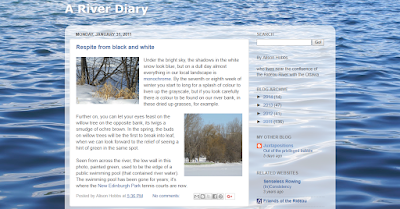 Just as it says, this is a blog that collects field notes for a small roadside area in the Nepean area. It was started when Hunt Club Road was extended west so it has seven years of notes regarding species identified (note all the labels listed under the right-hand column) and interesting behaviour for this suburban stretch. I have to applaud the author for their dedication to create such an incredible piece of phenoligical work. It's a delight to see what has been spotted over the years and a unique collection of field notes considering the size of the observation area and location (beside a very busy roadway). A map of the area showing years of tree plantings are included. This is a valuable blog that provides details of specific natural sites you may want to visit in the Ottawa region. The author Nick Stow takes you along on his outings including canoeing, hiking, birding and even biking. As a City of Ottawa Ecologist and Environmental Planner, you even get a sneak peak at some areas that are not (officially) public such as the newly acquired Manotick Drumlin Forest and he gives tips on conservation and has an amazing gallery of wildlife with species names. This is a beautifully conceived blog that provides details on various plants and wildlife, some local, some exotic and even some edibles! It is well researched and humorously written blog and my favourite series that the author Amelia has created are lively, detailed interviews with specific species that she encounters. She interviews Squirrels, talking Trilliums, Robins, R.W. 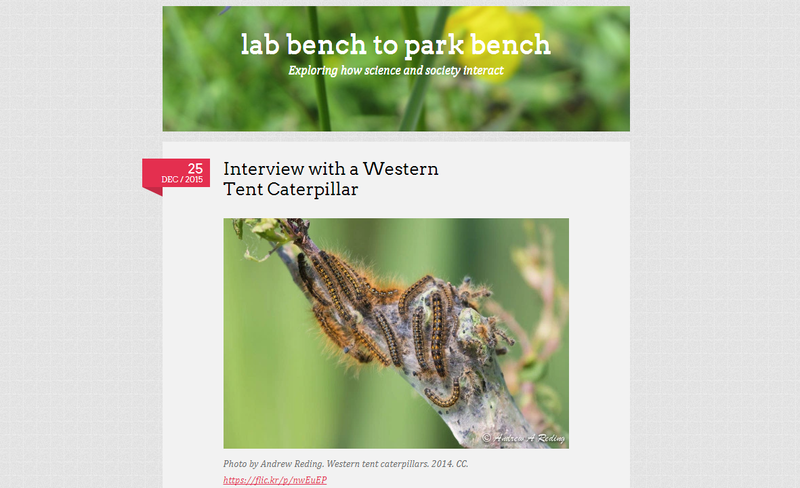 Blackbirds, Tent Caterpillars and even a snarky Swan. Find them all under the blog's "Interview" tag. Best of all some of these interviews are available in French. This blog is definitely a great resource for teachers! 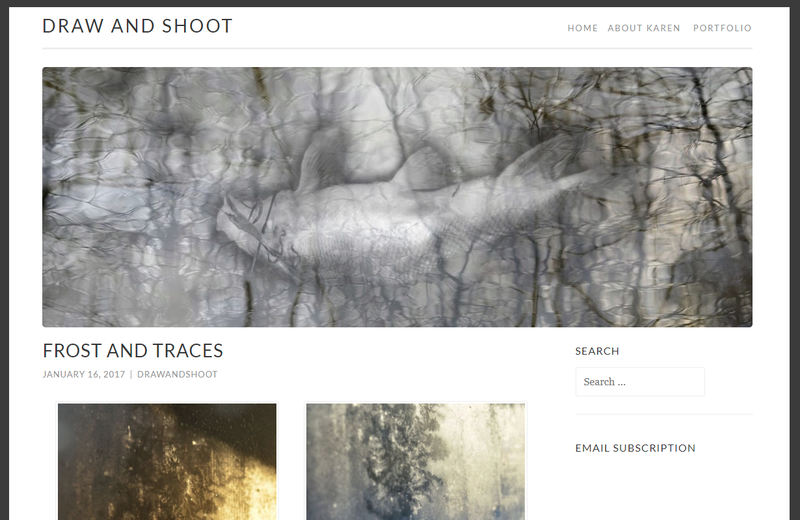 This impressive artist's blog showcases various natural elements in ethereal and sometimes dramatic photographs. Karen McRae has a keen eye and a unique way of capturing natural scenes, whether they are landscapes, macro images, studies of movement or other hauntingly captivating series including wrapped winter trees. She has a large dedicated following and I'm sure you too will be entranced with her almost "painter-ly" quality of capturing images with her camera. It's like she's created a canvas with her lens - not surprising as she's works in both mediums. 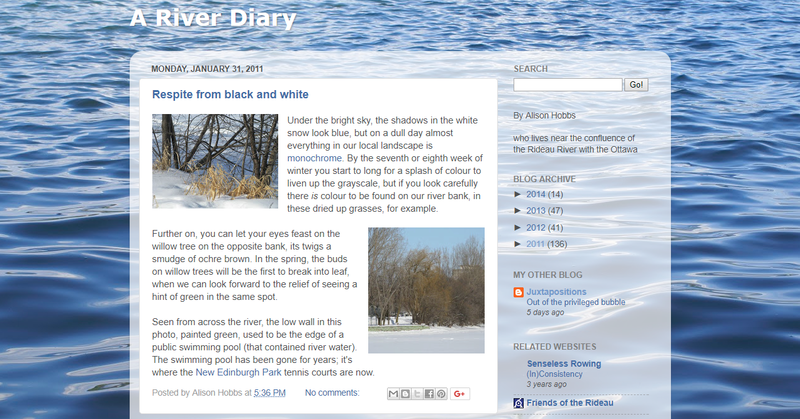 Alison Hobbs has created a thoughtful and observant journal of life by a river or actually a confluence of rivers both those here in the city and some in her travels. She offers a very detailed account throughout the seasons and provides personal and current commentary interspersed with photos including aerial ones! She talks about city development, aurora borealis sightings, city events, wildlife, geological details, snowshoeing, biking and occasional boating outings also. It's great that the archives are still up and available to read as it includes a total of 238 posts! Update: Great News - Alison Hobbs is starting to post new updates in her blog for 2017! While not strictly urban nature, I found Claire Elliott's blog in 2015 when she was writing about one of her favourite conservation location's in Ottawa: Mud Lake. In the first post I read she talked about the need to motivate herself to get outside in cold weather (which I could easily identify with!) but followed up with the reminder that once she gets out there it's incredibly rewarding. And seeing her photos - it's rewarding for her readers also! Other posts provide detailed updates of her birding outings and what she's seen, highlight her favourite wildlife experiences, share updates on classes she has taken and feature photo albums of the wildlife she has "captured" with her camera. It's a wonderful blog to peruse. While not living in Ottawa anymore, this is a great blog to continue to follow as it gives an insight into what it takes to pursue a Naturalist/Ornithologist's career including the many internships (including the East Coast and Tundra) that Claire has completed. And please share if you know of some good ones yourself!